Please note availability is limited for our Billfish charters as we only operate them on the most productive dates. Please also keep in mind that if your date appears as unavailable, we may have availability on another scheduled charter that same date, eg. Reef & Sport, Barra or Night Charter. 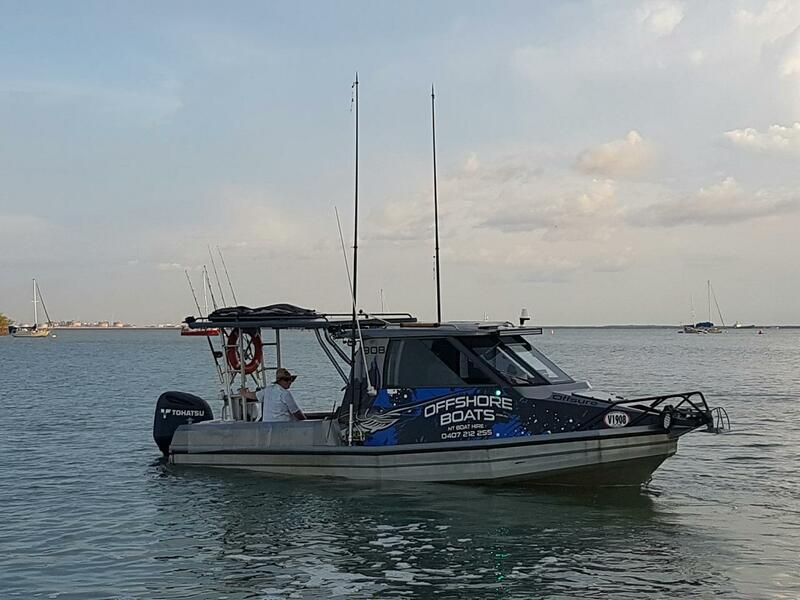 Offshore Darwin and Dundee Beach provides fantastic Sailfish and Marlin fishing waters. Fitted with outriggers and plenty of shade, our Stabicraft is the ideal vessel for targeting Billfish. With our expert guides and their years of experience, your once in a lifetime catch is just around the corner. Depending on the time of year and latest Billfish catches, your Billfish trip may begin in Darwin. However, we usually travel to Dundee Beach only for Billfish charters. Your day will begin with a pick up from your accomodation in the early morning. You will be transferred by vehicle to Dundee Beach with our vessel in tow. On the way, your guide will provide you with an outline of the plan for the day and a light breakfast. Upon arrival, we will launch the vessel and provide a safety briefing. This is followed about 45 minutes travel in our vessel to reach some of the best Sailfish grounds in the NT. Your fishing guide will point out sights of interest and happily discuss the itinerary and techniques further along the way. Upon arrival at your first destination, your guide will provide you with all the tutoring and assistance required, so you can master the various techniques. Our game fishing spread and techniques include birdie teasers, holographic teasers, deep diving lures, pushers, skip-baits and switch-baiting. Plenty of snacks, cool drinks and lunch are available to keep your energy and hydration up through out the day. Our Billfish charters are catch and release. If we incorporate some other reef or sport fishing into the day, you may like to keep your catch and take it home with you We will happily store your fish on ice until the end of the day. Upon return to the boat ramp, our team will clean, fillet and bag your fish to take home. Please note our team adheres strictly to Northern Territory fishing regulations and bag limits. Once we have the vessel back on the trailer, our guide will return you to your accommodation in Darwin. Some additional reef and sport fishing during the day is available upon request.